Inflatables in stock. 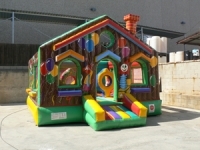 Here are the inflatable show we currently have in stock inmedata disposal. This section is used by our clients to make quick purchases. 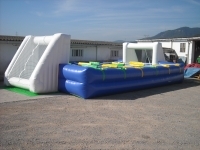 You can find several designs of bouncy castles and inflatable slides prepared for shipment. Visit this section and pick the one you like more bouncy and make your purchase. Inflatable slides set in a fort apache one of the most beloved games of children, inflatable cartoon translate this Indian ... Size: 6m long x 5m wide x 4m high. Turbine Nº2. One of the bouncy castles inflatables set in the bottom of the sea and an island with palm trees highlight bright colors. Bouncy Castles: Valid for rentals or professional use in parks. A good option for small spaces .... Size: 5m long x 4m wide x 3m high. Turbine Nº.1. 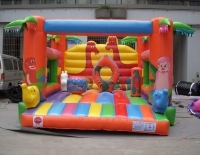 Bouncy castles inflatables: This model is set in the circus, house-shaped inflatable highlight their colors and patterns with amazing dolls. Great sheer drop zone in order to maximize space. As a real human table football but they were giant, the operation is the same. Highlights inflatable structure and reinforced steel bars ... Dimensions: 8mm long x 6m wide x 2.20 m high turbine Nº1. Inflatable slides. 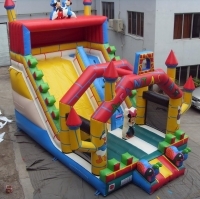 Set in a bouncy castle known fantasy drawings, selected colors red, yellow and blue ... Dimensions: 7m long x 4.5 m wide x 6m high. Turbine Nº2. Register for free to our newsletter if you want to receive e-mail news, promotions, offers, news, updates. Everything in regard to matters relating to entertainment and advertising inflatables. Upgrade!! Why are you going to spend the Inflatable looking for?